This page provides you with Executive Producer resume samples that you can use for inspiration in writing your own resume, or for creating one through our easy-to-use resume builder. Below you'll find our how-to section that will guide you through each section of a Executive producer resume. Have you reached the stage in which your creativity can make you a very good producer? Have you aimed to be one and you are looking for the best executive producer resume sample? Are you scared of the seeming difficulty of having to prepare a befitting resume? If your answers are yes, VisualCV.com has some good news for you. We are ready to help you set up a resume that will be effective in seeking for employment as an executive producer. The delicacy of the duty of an Executive Producer may scare you or you may even be oblivious of what to put into the resume, we have you covered. We are ready to design this resume to specifically suit your needs or to contain the most important details about your life. 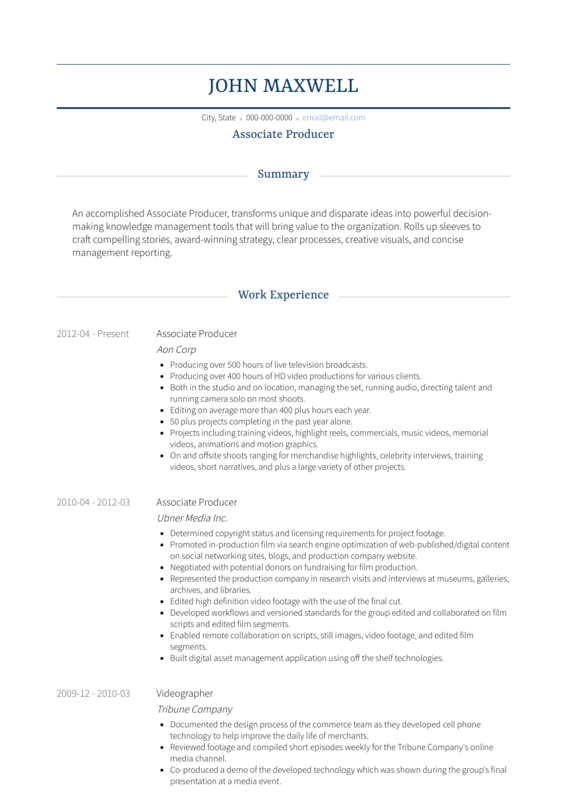 How to Write Executive Producer Resume? First and foremost, you want to create a rough draft of the information you want to add and put it to one side. You can refer to this when it comes to adding important details you might forget of. However, be aware that you aren’t going to need every bit of information. Product manager resumes should be precise and to the point when it comes to their years of experience and work history as it looks a lot better. We strongly suggest you choose the reverse-chronological layout, as it perfectly fits a product manager resume: not only it shows your most recent work at the top, it also helps you highlight your last few years. Next, you want to choose a font. The font you choose can determine whether a recruiter takes the time to read what you have to say or throw it to one side. Now, fonts can often catch a lot of people out simply because they use the wrong ones. You want an easy-to-read and legible font with big headings so that you have the best chance of recruiters looking at it. Finally, choose a sensible color for your resume. It might appear nice to make every section a different color but it’s not always the best thought out idea. Stick to one, maximum two colors. We will not let you skip to the next section without the most valuable tip: pdf over Microsoft Word, trust us! The summary section of an executive producer resume is designed to be an highlight on the important details of the resume. Any detail that shouldn’t be ignored is included into this summary section. For executive producers, the work history section is a very delicate section in the resume. Not only it contains all your previous employments and the different achievements gotten at these work experiences, it is also your pitch to your next employer! Please include all your roles and responsibilities at your previous job and the duration of your employment. List all the contents of your reverse-chronological order. This section is a measure of competence. The educational section of the resume of an executive producer is a way to showcase all the different trainings which you have been involved in. This is also another display of competence for the clients. You should list all your recent trainings and certifications first. Any accolades received during the educational period should be stated. Include an unprofessional email address! List your Microsoft Office skills! Finally, if you are looking for the best executive producer resume templates, you should check this masterpiece we have been working on here : many professionals like you have successfully used it to take their career to the next level.